All-Purpose Peroxide Cleaner X-RAYX-Ray biodegradable is a ready-to-use surfactants all provides purpose superior peroxide cleaning cleaner. and The deodorizing, combination yet of is hydrogen environmentally peroxide responsible. This is a spray n’ wipe cleaner for all surfaces found in homes, offi ces, schools, industry and/or food service.Why X-RayX-Ray will show you where dirt, grime and germs are hiding,,,just like an X-Ray. Just spray on a surface, and then watch for foam generation. Areas where you see foam being generated is where the germs are hiding and the oxygen is being released to do it’s job....clean, brighten and deodorize.Use on any Water Safe SurfacesX-Ray can be used for cleaning all water safe surfaces including: tile, grout, sinks, countertops, lunch tables, tub and showers areas, toilets, urinals, sinks, garbage cans....basically any kitchen or restroom surface. Safe for use on porcelain, vinyl, rubber, aluminum, stainless steel, fi berglass, sealed wood, painted sur- faces, ceramic, grout, plastic etc. Do not use X-Ray on Marble or any other sensitive surfaces.Cleans, Deodorizes and BrightensX-Ray will clean, deodorize and brighten all in one- step. For areas where foam develops, this is where germs and grime are hiding. Extra contact time may be benefi cial to maximize the deodorization and bright- ning properties of X-Ray.Carpet SpottingX-Ray will clean most spots in carpet. Safe to use on olefi n, nylon and wool carpets. The peroxide will remove brighten and deodorize spots and stains. Use on pet and beverage stains. 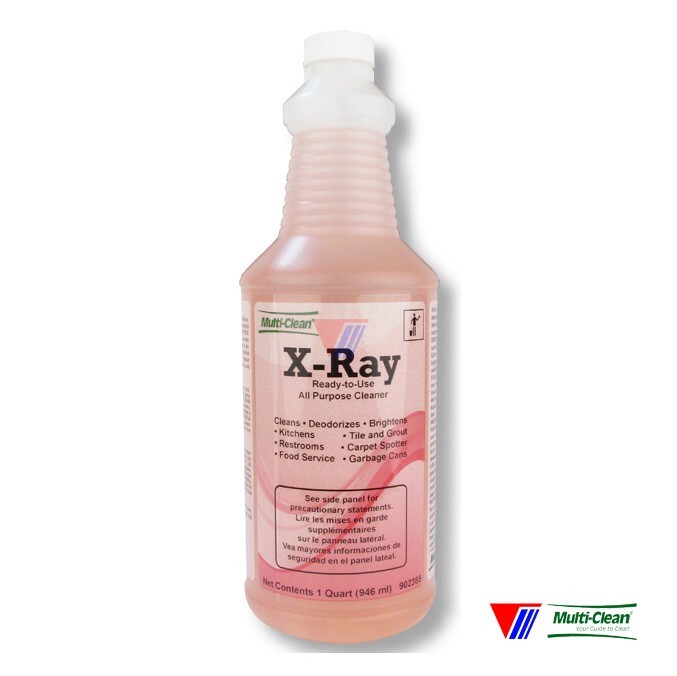 X-Ray biodegradable is a ready-to-use surfactants all provides purpose superior peroxide cleaning cleaner. and The deodorizing, combination yet of is hydrogen environmentally peroxide responsible. This is a spray n’ wipe cleaner for all surfaces found in homes, offi ces, schools, industry and/or food service. X-Ray will show you where dirt, grime and germs are hiding,,,just like an X-Ray. Just spray on a surface, and then watch for foam generation. Areas where you see foam being generated is where the germs are hiding and the oxygen is being released to do it’s job....clean, brighten and deodorize. X-Ray can be used for cleaning all water safe surfaces including: tile, grout, sinks, countertops, lunch tables, tub and showers areas, toilets, urinals, sinks, garbage cans....basically any kitchen or restroom surface. Safe for use on porcelain, vinyl, rubber, aluminum, stainless steel, fi berglass, sealed wood, painted sur- faces, ceramic, grout, plastic etc. Do not use X-Ray on Marble or any other sensitive surfaces. X-Ray will clean, deodorize and brighten all in one- step. For areas where foam develops, this is where germs and grime are hiding. Extra contact time may be benefi cial to maximize the deodorization and bright- ning properties of X-Ray. X-Ray will clean most spots in carpet. Safe to use on olefi n, nylon and wool carpets. The peroxide will remove brighten and deodorize spots and stains. Use on pet and beverage stains.